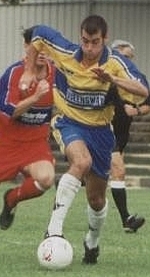 Gary joined the Saints from Barnet in the 2000/01 season. Missed much of his first season with the Saints due to a succession of injuries but still managed 11 goals in 23 appearances. Signed for Ryman Division One North side Harlow Town in August 2002 and then switched to Billericay Town in December `02. Despite scoring regularly for Billericay in 2003/04 he was somewhat surprisingly allowed to move to East Thurrock United in December 2003 and then joined Dr Martens Premier side Chelmsford City in March 2004.